Teens looking to find seasonal employment aren't likely to find landing that job is any easier this summer than it was a year ago, when teen hiring hit historic lows, a new report shows. 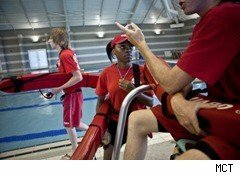 Lackluster improvements in the labor market, combined with cutbacks in government spending at local, state and federal levels, will make finding a summer job this year as challenging as it was in 2010, according to the latest annual teen summer outlook, released Thursday by job-services firm Challenger, Gray & Christmas. Last year, teenage job seekers experienced the weakest seasonal job market in decades. Data from the Bureau of Labor Statistics show that from May through July 2010, employment among 16 to 19 year olds increased by just 960,000 jobs, the lowest level since 1949. Further, teen employment last year in July, considered the peak month for teen employment, was at its lowest level since 1959. 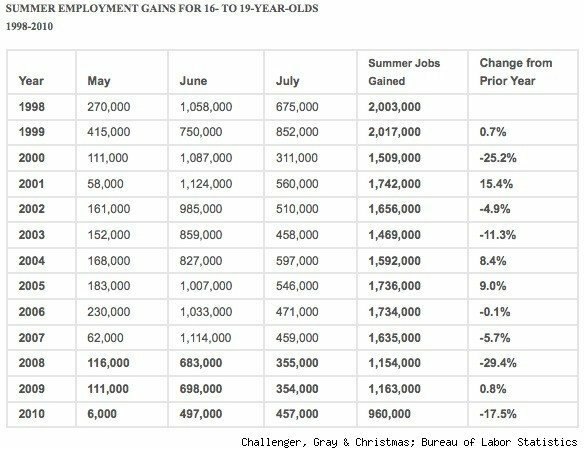 "Any teen hiring gains achieved in the slowly improving private sector could be offset by losses in the public sector, where teenagers often find summer employment as camp counselors, lifeguards, office assistants, laborers and clerks," says Challenger CEO John Challenger. One city targeting teen jobs for cuts is Chicago, where Challenger's firm is based. The city said this week it is reducing the number of summer jobs by 22% because of cuts in federal stimulus money. Beyond fiscal woes, gas prices, should they continue on their upward trajectory, are expected to result in less teen hiring by amusement parks, landscapers and other businesses that are hit hard when energy costs soar. Still, Challenger says, not all is lost. He notes, for example, Chicago is still looking to offer 14,000 jobs to teens this summer, despite its cuts. "Even at its worst, employment among teenagers experienced a net gain of nearly 1 million jobs last year," he says. "But in the current environment it will be more important than ever for teens to begin their summer job searches early." The expected slack in teen summer employment is just one more bit of news that shows the nation's job-creation engine is stuck in low gear. A poll released Thursday by Gallup showed the U.S. unemployment rate stood at 10.2% in mid-March, that's 1.3 percentage points higher than the 8.9% rate calculated by the Labor Department in February. Gallup says the gap between its unemployment number and that of the federal government can be explained in part by the way in which the Labor Department calculates its numbers, adjusting them for seasonal variations in hiring. That's something that Gallup doesn't do. Further, the polling group says, its unemployment rate is more up-to-date. Gallup's mid-March data include jobless figures for much of March, whereas the government's latest unemployment rate is based on the employment situation in mid-February. Most importantly, a key reason the federal government's unemployment rate is dropping has to do with the so-called participation rate, the percentage of working-age Americans counted as being in the workforce. In February, the Labor Department recorded its lowest participation rate since 1984. In essence, Gallup says, the low participation rate suggests that the unemployment rate as calculated by the government is falling because of a rise in the number of discouraged workers who have stopped looking for work -- not because they are getting new jobs.